For Breakfast I prepared some Glier’s Turkey Goetta and prepared some Simply Potatoes Hash Browns. I just love the combination of Turkey Goetta and Hash Browns. I also had my morning cup of Bigelow Decaf Green Tea. What a beautiful day today! No Rain finally, mostly sunny and 72 degrees. Well Dad will be coming home tomorrow, finally! He’s been in the hospital and rehab center for most of this year so far. I just hope he’s able to stay healthy enough to remain here. It will be good to have him home. After Breakfast I went to Walmart and then on to Kroger to pick some items up for Mom. Back home I repaired one of our outdoor chairs. Then got the cart out for the rest of the afternoon. For Dinner tonight I prepared a Turkey Pepperoni and Turkey Sausage Pita Bread Pizzas. I used Joseph’s Flax/Oat Bran and Stone Ground Whole Wheat Pita Bread for my Pizza Pie instead of regular Dough Pizza Pie. I love using Joseph’s Pita Breads, always fresh and they’re only 60 calories, 1.5 grams fat, and 5 net carbs! But I can only find them online so I have to order them now. A huge saving of calories and carbs over using normal Pizza Crust, without sacrificing taste. I preheated the oven on 400 degrees. To bake the Pita Pizzas I used a large Cookie Sheet. To prepare them I brushed them with a light coat of Extra Virgin Olive Oil, the coating of Oil browns it up just right. I then baked it for 5 minutes, just to brown it up a bit. Removed them from the oven and made my Pizzas. For my toppings I used Ragu Homestyle Pizza Sauce, Jennie – O Lean Turkey Ground Breakfast Sausage, Hormel Turkey Pepperoni, Sliced Black and Green Olives, sliced Baby Bella Mushrooms, 2 Anchovies Fillets, and Sargento Reduced Fat Shredded Mozzarella Cheese. It took less than 10 minutes in the oven until everything heated up and the Cheese melted.Pizza is served! Everything combined makes one delicious Pizza! And the good thing is you can load these Pita Bread Pizzas up with toppings and still not have a lot of calories and carbs, my type of Pizza! Bakes up ans tastes like a Thin-Crust Pizza For dessert later a Jello Sugar Free Dark Chocolate Pudding topped with Cool Whip Free. Joseph’s provides you with a healthy, reduced carb, high protein pita bread containing Flax, an excellent source of Omega-3! These Pitas have no cholesterol and contain three healthy ingredients: Flax, Oat Bran, and Whole Wheat which may help protect your heart while losing weight! For Breakfast I broke out the Goetta again! I prepared some Glier’s Turkey Goetta and prepared some Simply Potatoes Hash Browns. I just love the combination of Turkey Goetta and Hash Browns. I also had my usual cup of Bigelow Decaf Green Tea. The rain showers have returned after drying out for a couple of days. High in the mid 80’s and humid, as usual. Ran an errand for Mom and then I stopped by Walmart Vision Center to have my glasses adjusted. Then went to the hospital to see a friend of mine that had surgery yesterday, she’s doing good and should be home soon! Back home and puttered around the house doing a few things to finish out the day. 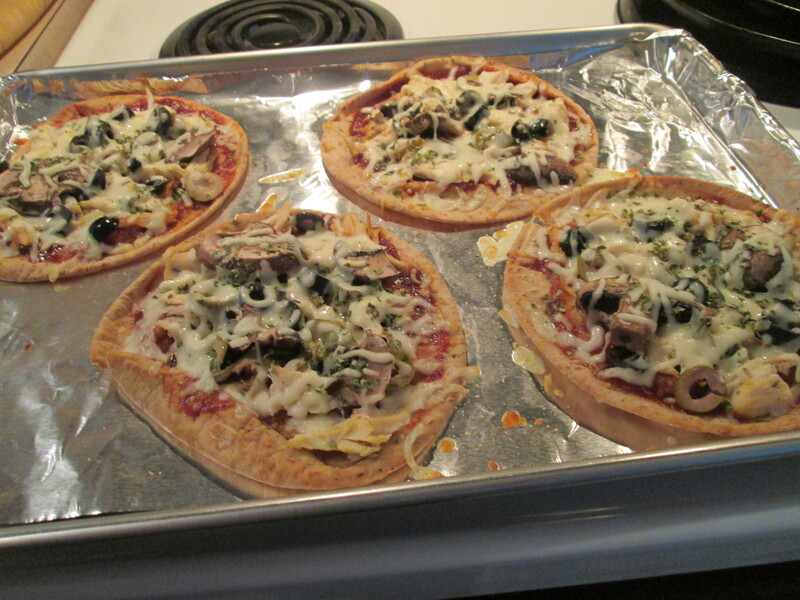 For Dinner tonight I prepared a Turkey Pepperoni and Turkey Sausage Pita Bread Pizzas. I used Joseph’s Flax/Oat Bran and Stone Ground Whole Wheat Pita Bread for my Pizza Pie instead of regular Dough Pizza Pie. I love using Joseph’s Pita Breads, always fresh and they’re only 60 calories, 1.5 grams fat, and 5 net carbs! 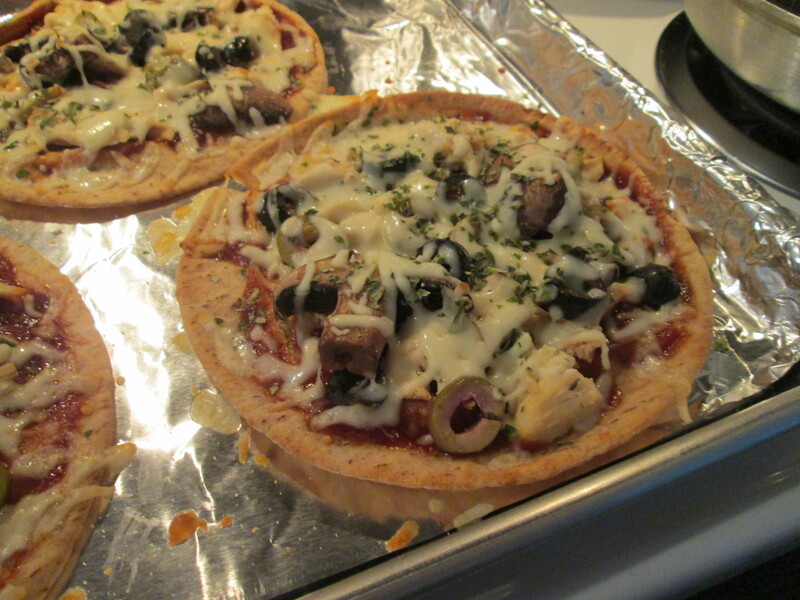 A huge saving of calories and carbs over using normal Pizza Crust, without sacrificing taste. I preheated the oven on 400 degrees. To bake the Pita Pizzas I used a large Cookie Sheet. To prepare them I brushed them with a light coat of Extra Virgin Olive Oil, the coating of Oil browns it up just right. I then baked it for 5 minutes, just to brown it up a bit. Removed them from the oven and made my Pizzas. For my toppings I used Ragu Homestyle Pizza Sauce, Jennie – O Lean Turkey Breakfast Sausage, Hormel Turkey Pepperoni, Sliced Black and Green Olives, sliced Baby Bella Mushrooms, 2 Anchovies Fillets, and Sargento Reduced Fat Shredded Mozzarella Cheese. It took less than 10 minutes in the oven until everything heated up and the Cheese melted.Pizza is served! Everything combined makes one delicious Pizza! And the good thing is you can load these Pita Bread Pizzas up with toppings and still not have a lot of calories and carbs, my type of Pizza! Bakes up ans tastes like a Thin-Crust Pizza For dessert later a Jello Sugar Free Dark Chocolate Mousse. Started my morning off with Fried Turkey Spam, 1 Egg Sunnyside Up, 2 Slices Klosterman Wheat Bread, and a cup of hot brewed Bigelow Decaf Green Tea. Did some laundry for Mom. Finally got her out of the house to enjoy herself. She met her cousin, who is like a sister to her, for lunch. She needed to get out, it’s just so stressful dealing with my Dad as his health isn’t getting any better and doesn’t do anything to try to get better. Moving on, it’s a beautiful day outside, around 80 or so and low humidity (No Rain either). 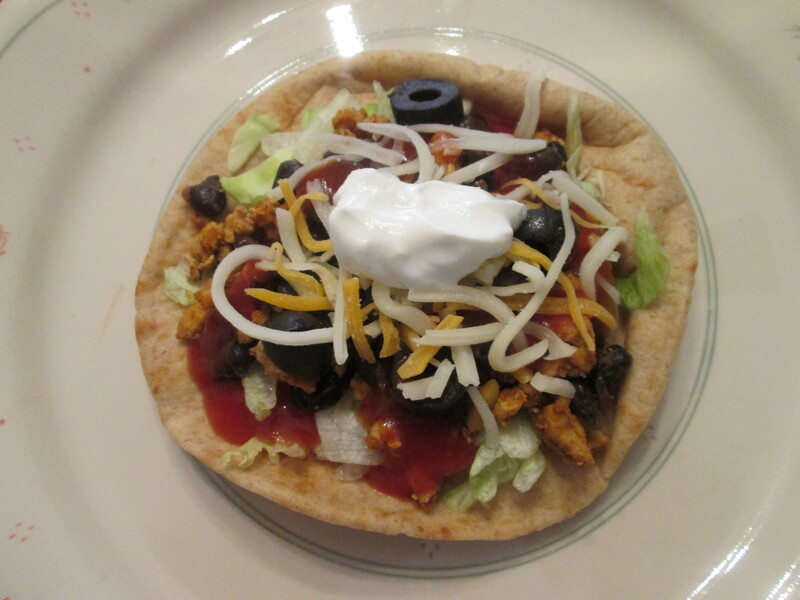 For dinner tonight I prepared Turkey and Black Bean Pita Bread Tacos. I used my favorite Ground Turkey, Jennie-O Extra Lean Ground Turkey Breast. 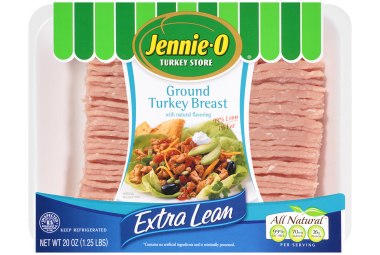 The Jennie-O Extra Lean Ground Turkey Breast comes in at 120 calories, 1.5g of Fat, and 0 carbs and comes out perfect every time! To prepare the Turkey I fried it in a medium size skillet in Extra Virgin Oil and seasoned it with Sea Salt, Ground Roasted Cumin, Cilantro Flakes, and 1 package of Old El Paso Low Sodium Taco Seasoning. As I added the Taco Seasoning Mix, 3/4 cup of Water, and I also added 1 can of Bush’s Low Sodium Black Beans, I drained and rinsed them before I added them. Black Beans with Ground Turkey is a perfect pairing for Tacos. Mixed well until everything was coated and then simmered another 5 minutes until heated through. For my other Taco toppings I used 1 small can of Mario Sliced Black Olives, sliced Green Olives, some Whole Kernel Corn (Leftover from Dinner the other night), Sargento 4 Cheese Mexican Shredded Reduced Fat Cheese, Shredded Lettuce, Old El Paso Taco Sauce, and Daisy Reduced Fat Sour Cream and all in a Joseph Flax, Oat Bran and Whole Wheat Pita Bread. I love these Pita Breads! 50 Calories, 1g Fat and only 4 Net Carbs! I use them instead of Bread when I can. 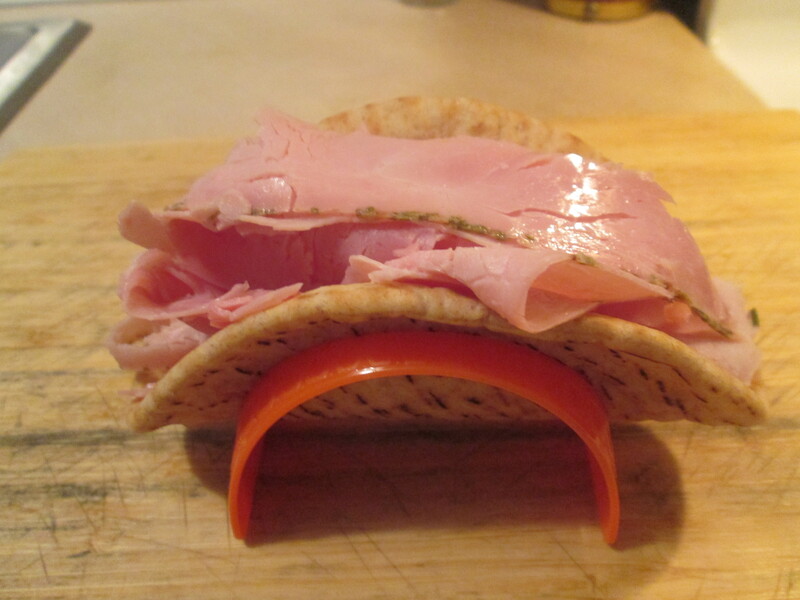 The Pita Bread makes a perfect Taco and healthier Taco! For dessert later a Healthy Choice Chocolate Swirl Frozen Greek Yogurt. Flax Variety Pack Now enjoy some of Joseph’s most popular products together in one package! The Flax Variety Pack allows you to enjoy three packages of our Flax Pita Bread, Mini Flax Pita Bread, and Flax Lavash. Went to the store and bank early, before the rain moved in. Then it was a day of cleaning. We have a walk-in closet that was packed full of basically junk. So that took up all afternoon. 1 more junk closet to go. For dinner tonight, BBQ Pulled Chicken Breast Pita Bread Pizza. Just add the Cheese and ready for the oven! I preheated the oven on 400 degrees. To bake the Pizza I used a large Cookie Sheet. To prepare them I brushed them with a light coat of Extra Virgin Olive Oil, the coating of Oil browns it up just right. I then baked it for 5 minutes, just to brown it up a bit. Removed them from the oven and made my Pizzas. I put a layer of the Sticky Stuff BBQ Sauce, added the Chicken, the Olives, Mushrooms, and topped it with Shredded Mozzarella Cheese. It took less than 10 minutes in the oven until everything heated up and the Cheese melted.Pizza is served! 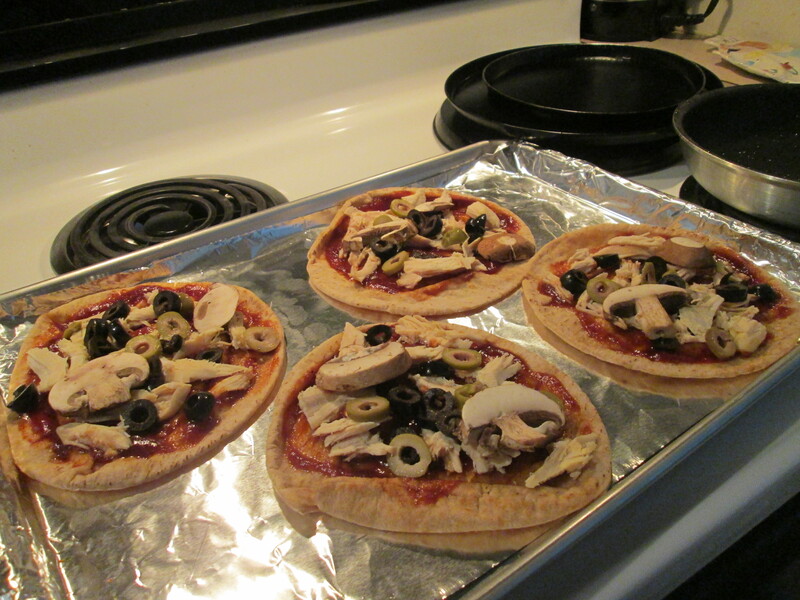 The Pita Bread makes one fine Pizza, along with the Chicken and JB’s Sticky Stuff BBQ Sauce. Delicious! For dessert later a Jello Sugar Free Dark Chocolate Pudding. Joseph’s provides you with a healthy, reduced carb, high protein pita bread with no cholesterol containing three healthy ingredients, Oat Bran, Whole Wheat and Plant Sterols. Plant Sterols are a natural nutrient present in small quantities in many fruits, vegetables and grains. F.D.A Guidelines state that Plant Sterols, eaten twice a day with meals for 0.8g daily total, may reduce heart disease risk in a diet low in saturated fat & cholesterol. 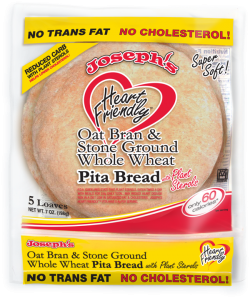 Joseph’s Heart Friendly Pita has 0.4g per serving. Joseph’s Oat Bran and Whole Wheat Flour Pita Bread has 1.5 grams fat, 0 cholesterol, 334 mg sodium, 10 total carbs (5g diegary fiber, 1 sugar), and 7g protien. That means each pita has a total of only 5 net carbs. 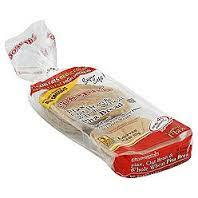 The bread is made by Joseph’s Middle East Bakery, Inc. in Lawrence, Massachusetts. 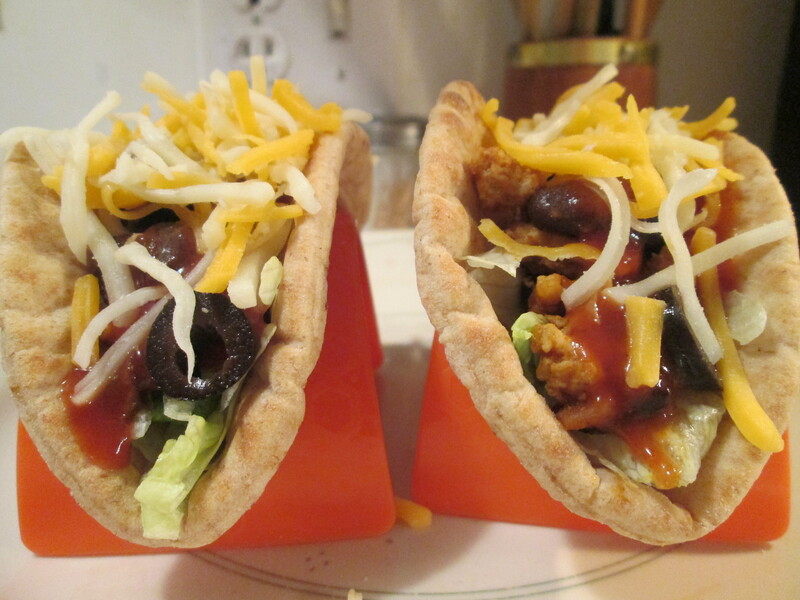 Turkey and Black Bean Pita Bread Tacos! Went out about 7 am this morning to get the morning paper and it was C-O-L-D, how COLD minus 6 degrees. Thankfully there was no wind blowing so there wasn’t a wind chill factor for a change. I had already had my breakfast, work out, and shower by the time my parents were up and having their breakfast. So while they were eating I thought I would go ahead and clean the pots and pans Mom had used to make their breakfast. When I cook I try to eat healthy by using the right oils, food, and watching the serving portion sizes. But as I started to clean up for Mom it was amazing how much cooking oil she uses. I poured out enough cooking oil to fix my meals for a week, she uses Vegetable Oil where I use Canola Oil and Extra Virgin Olive Oil. But she cooks as she was taught by her Mom, my Grandmother. I’ve been cooking and eating healthier ever since 2001, when I lost my leg to cancer. Just different styles of cooking, I don’t think I could ever go back to not eating healthy. For dinner tonight It’s Taco Night! 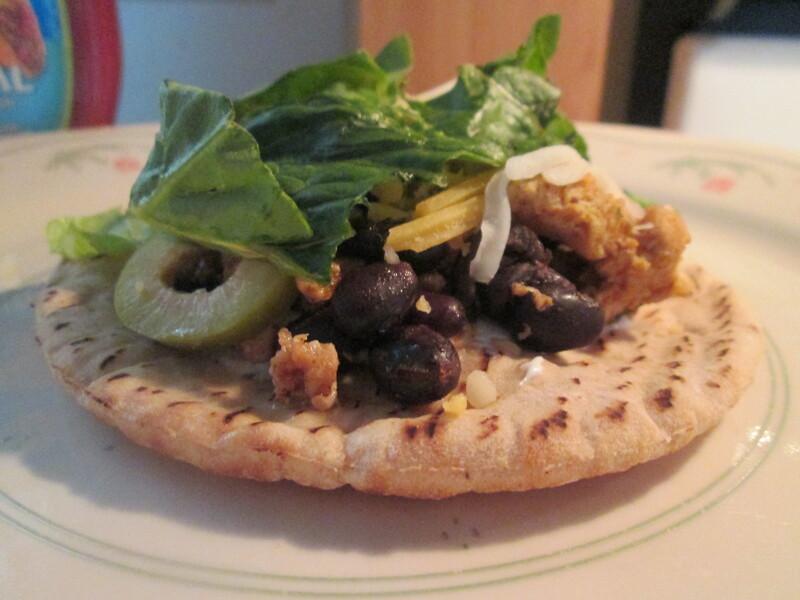 I prepared Turkey and Black Bean Pita Bread Tacos. I used my usual and favorite Gound Turkey, Jennie-O Extra Lean Ground Turkey Breast. The Jennie-O Extra Lean Ground Turkey Breast is 120 calories, 1.5g of Fat, and 0 carbs and comes out perfect every time! To prepare the Turkey I fried it in a medium size skillet in Canola Oil and seasoned it with Sea Salt, Ground Roasted Cumin, Cilantro Flakes, and 1 package of Old El Paso Low Sodium Taco Seasoning. As I added the Taco Seasoning Mix I also added 1 can of Bush’s Low Sodium Black Beans, I drained and rinsed them before I added them. 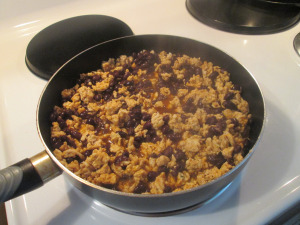 Black Beans with Ground Turkey is a perfect pairing for Tacos. Mixed well until everything was coated and then simmered another 5 minutes until heated through. For my other Taco toppings I used 1 small can of Mario Sliced Black Olives, 1 small diced Tomato, Sargento 4 Cheese Mexican Shredded Reduced Fat Cheese, Dole Shredded Lettuce, Old El Paso Taco Sauce, and all in a Joseph Flax, Oat Bran and Whole Wheat Pita Bread. I love these Pita Breads! 50 Calories, 1g Fat and only 4 Net Carbs! I use them instead of Bread when I can. For dessert later a Healthy Choice Chocolate Swirl Frozen Yogurt. It’s been one rough 24 hour period for me as the Phantom Pains kicked in last night around 8:00 and have continued through out today. I had a bout with these earlier in the week, so it’s unusual for them to start again so close together. Just hoping they ease up before I go to bed, if not it makes for one long and uneasy night! On to dinner, I had Tacos the other night with a lot of the ingredients leftover. So tonight I gathered up all the leftovers and prepared Black Bean and Turkey Flatbread Wraps. I used the remainder Jennie – O Extra Lean Ground Turkey Breast, I had this leftover from the other night. I fried it in Canola Oil and seasoned it with Sea Salt, Ground Roasted Cumin, Cilantro Flakes, and 1 package of Old El Paso Low Sodium Taco Seasoning. As I added the Taco Seasoning Mix I also added a 1/2 can of the Bush’s Low Sodium Black Beans that were leftover, I drained and rinsed them before I added them. As usual Black Beans with Ground Turkey make the perfect pairing. Mixed well until everything was coated and then simmered another 5 minutes until heated through. For my other toppings I used 1 small can of Mario Sliced Black Olives, Sargento 4 Cheese Mexican Shredded Reduced Fat Cheese, Dole Shredded Lettuce, Old El Paso Taco Sauce, and a teaspoon of Daisy Reduced Fat Sour Cream to top everything off. Served everything on a Joseph’s Flax, Oat Bran, and Whole Wheat Pita Bread. 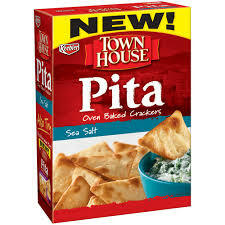 This my favorite Pita Bread, this stuff is great! It stays fresh, you can freeze it, and it’s only 50 calories and 4 net carbs for one kind and only 60 calories and 4 net carbs for a bit bigger size. After adding all my toppings I just folded them half, like a soft taco. Really enjoyed these! For dessert later a Healthy Choice Chocolate Swirl Frozen Yogurt. Spent the day on a project I’ve been meaning to do for a while now. I refinshed a small book-case I have. The top of it had watermarks on it that had ruined the finish. 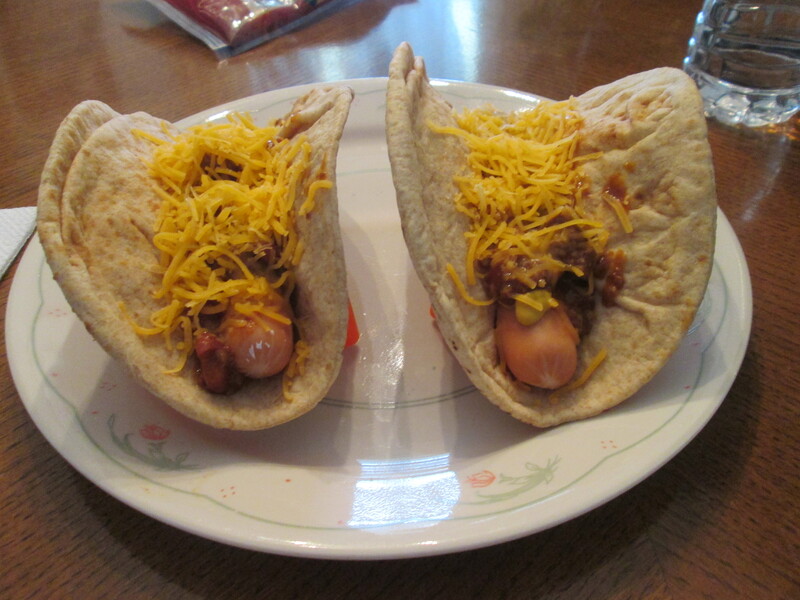 For dinner I prepared Pita Bread Chili Dogs. I’ve using Pita Bread instead of Buns lately, lower in calories, fat, and carbs. So I thought why not try a Chili and Cheese Dog. I used Ball Park Smoked White Turkey Franks, which I use whenever I eat Hot Dogs, best tasting Turkey Frank there is. You can grill them or boil them, I boiled these. Then for my Chili I used Hormel Turkey Chili with Beans and Sargento Reduced Fat Shredded Sharp Cheddar along with some French’s Yellow Mustard. While warming the Chili up I added a few shakes of Frank’s Red Hot Sauce, everythings better with Frank’s! Then for my Pita Bread I used Joseph’s Flax Oat Bran and Whole Wheat Pita Bread. I’ve been dropping a few pounds and Joseph’s helps by cutting the calories, fat, and carbs from sandwiches or anything else I would normally use a Bun for. Turned out delicious! I’ll have these again soon. For a dessert/snack later a new product, Keebler Town House Oven Baked Pita Crackers w/ Sea Salt. I had those and dipped them in some Helluva Good Bacon and Horse Radish Sour Cream Dip. Made a nice combo, the Crackers are 70 calories and 11 carbs for 6 Crackers. Host a happy get-together with these crisp, oven-baked crackers with a rustic blend of savory herbs and spices inspired by pita crackers. They make the perfect pair with your favorite toppings and dips. 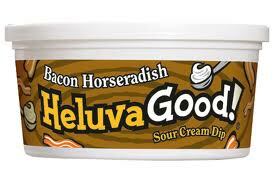 Heluva Good!® Bacon Horseradish Dip blends flavorful bacon bits and zesty horseradish with creamy sour cream to create intense flavor that adds kick to any BBQ or get together. CULTURED PASTEURIZED MILK, CREAM AND NONFAT MILK, SALT SUGAR, BACON BITS (CURED WITH WATER, SALT, SODIUM PHOSPHATE, SODIUM NITRATE, SMOKE FLAVORING, SUGAR, SODIUM ERYTHORBATE, BROWN SUGAR, SODIUM ASCORBATE, POTASSIUM CHLORIDE, DEXTROSE), TORULA YEAST (SULFITES), DEHYDRATED HORSERADISH, SILICON DIOXIDE, MONOSODIUM GLUTAMATE, HYDROLYZED CORN GLUTEN, DEHYDRATED ONION, MODIFIED CORN STARCH, NATURAL FLAVORS, SPICE, DISODIUM IOSINATE, AND DISODIUM GUANYLATE, MALTODEXTRIN, CARAMEL COLOR, YEAST EXTRACT, GELATIN, POTASSIUM SORBATE (TO PRESERVE FRESHNESS), SOYBEAN OIL AND ENZYME. As I had said in an earlier post I’ve been using Joseph’s Flax, Oat Bran, and Whole Wheat Pita Bread ever since I came across it in the Walmart Bakery. At only 50 Calories and 4 Net Carbs you can’t beat it. For breakfast a Scrambled Egg and Cheese Wrap. Scrambled 1 Egg, seasoned with Sea Salt, Ground Black Pepper, a few shakes of Frank’s Red Hot Sauce, and a sprinkle of Sargento Reduced Fat Shredded Cheddar Cheese. 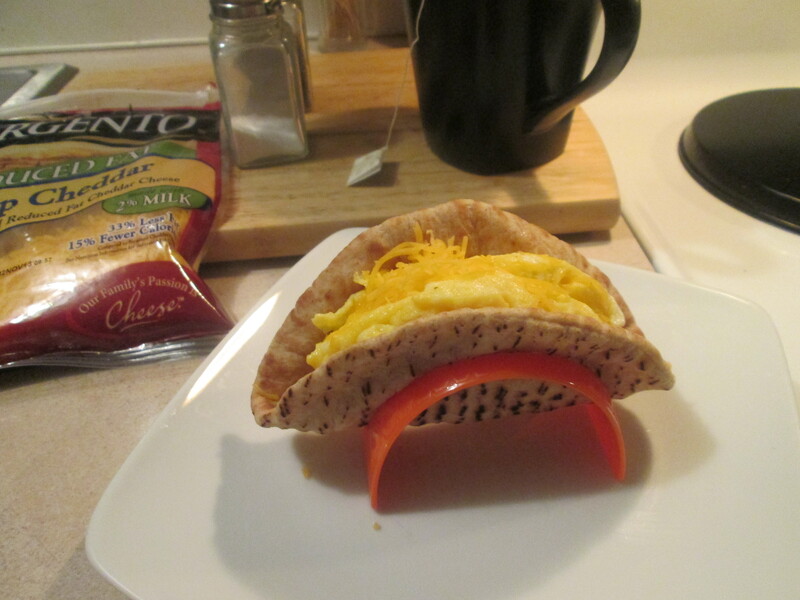 Just put the Scrambled Egg in the Pita Bread and top with a light sprinkle of the Sargento Shredded Cheddar, one quick, easy and healthy way to start the morning.